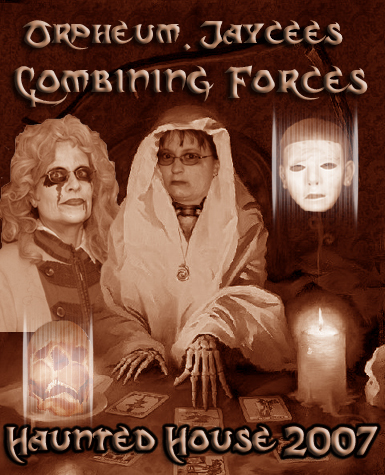 Introduction: From 1989-2007, the Foxboro Jaycees Haunted House was the largest not-for-profit Haunt in New England, our biggest fundraiser, an extremely popular event attended by thousands of people, and my favorite Jaycee project. This is the column I wrote for the 2006 and 2007 Haunts. Of course, this is an archive, so things like show times, dates, price, and out-of-date historical context, are removed. So why include this column here? I think it’s well worth a read because the Jaycees’ enthusiasm and dedication to our Haunted House – and helping the community – is readily apparent, as is my great love for the chapter and our Haunted House. I put a lot of passion into these columns, and the excitement of our annual boo-fest always shines through. Those were good times. In 2007, the Foxboro Jaycees and the Orpheum Theater are again combining their talent and experience to produce a spectacular haunt, located inside the Orpheum Theater, Foxboro Massachusetts. This is the 19th year the Jaycees have presented a haunted house, and we are delighted to again combine forces with the artists and actors of the Orpheum Theater to bring Foxboro its best haunted house yet.This is no children’s haunt; this is no slapped-together haunted fun house. We are a live-action show with dozens of performers and a crew of nearly 100. We combine nineteen years of Jaycee haunting expertise and the impressive professional creative talent of the Orpheum cast and crew to produce a very impressive professional haunted show. 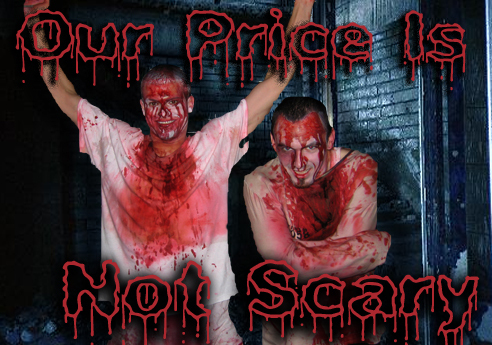 We WILL scare you, entertain you, and make you laugh. …And very likely, we will scare the hell out of you.Although the haunt takes place in a theatre, this is NOT a SHOW where you SIT and WATCH the stage. You will tour the entire theater with your ushers… …If you dare. Where is the Orpheum Theater? Tell me about the Orpheum Foxboro. The Orpheum Theatre was originally built in 1926 as a silent movie house. Through several owners and a conversion to a three-screen theatre in 1984, it continued to show movies until it was closed in 1989. The Foxboro Regional Center for the Performing Arts (FRCPA) was established in 1993 and purchased the building with the purpose of renovating and operating it as a functional live performance theatre. The theatre re-opened in September 1994 and housed several local community arts organizations, including Bay Colony Productions. Bay Colony Productions was founded in 1999, a local community theatre organization dedicated to promoting the performing arts in the area through both high quality performances and devoted educational programs.In October 2004, Bay Colony Productions purchased the Orpheum Theatre from FRCPA. Bay Colony continues to conduct business under the name of the Orpheum Theatre and presents professional quality stage plays, musical theatre, dance, musical events, youth theatre programs, charity events and concerts, movies and family entertainment.Today, Bay Colony Productions at the Orpheum Theatre is recognized, respected and well-known throughout the area as a source of entertainment, education, cultural impact and influence in the community. Tell me about the Foxboro Jaycees. Part of the worldwide Junior Chamber of Commerce (Jaycee) organization founded in 1918, the Foxboro Jaycees were chartered in 1961 and are a dynamic and enthusiastic group providing civic service through the organized efforts of the people of the community. They promote the welfare of Foxboro and its citizens through active, constructive projects. The Jaycees provide their membership training in leadership, make lasting friendships, and learn managerial, project and people skills.The Foxboro Jaycees are responsible for over one hundred Foxboro community service projects, such as the annual haunted house fund-raiser (Since 1989, Foxboro’s original haunt) the 5K fun run for charity, the summer concerts on the common, Senior Appreciation Day, National Family Night Out, sand for seniors, Easter egg hunt, pancake breakfast to benefit Foxboro Youth Basketball, Founders Day activities, student essay contests, as well as Christmas activities such as Santa on the common, decorating the common with Christmas lights, and far more. They built the Foxboro Common bandstand, the Booth Skating Park and the Payson Road Playground. The Foxboro Jaycees donate money to over 26 different charities, needy individuals, athletes and human service organizations. They donate thousands of dollars each year to the Foxboro Discretionary Fund, Founders Day fireworks committee, Foxboro High School college bound seniors, South Foxboro Community Club and various sports leagues in Foxboro. Around Foxboro, they are also actively involved helping other worthwhile causes. They are the number one rated Jaycee chapter in the state of Massachusetts. Their haunted house is their biggest fundraiser of the year and ALL (yes, ALL) of the Jaycee haunted house proceeds go back into the community. By visiting their haunted house, you help them make possible our multitude of community services, as well as scholarships, donations, and far more. How did your *HAUNTED HOUSE* begin? In 1989, the Mansfield and Foxboro Jaycees embarked on a new, untested fundraiser – a Haunted House. By 1992, the Foxboro Jaycees Haunted House was an annual event for more than nine thousand visitors each year. Over the last 19 years, we have run our haunt in tunnels under an abandoned hospital, through the woods of an old camp, and even at a mall. We have visited Old England and Hollywood. We have braved haunted mansions, villages, museums and universities, the old west, a magic school, and Camp Fright. We experienced a terrifying nightmare, found a lost jungle city, and even traveled through time. In 2006 we were delighted to partner with the Orpheum for the haunted theater, and in 2007 we’re back at the Orpheum for an all-new show — our best haunt yet. Is your Haunted House scary? Our haunt is scary. On previous journeys we’ve encountered clowns, murderers, temple demons, burning witches, butchers, carnies, ax-wielding mayors, cheating wives, circus folk, bank robbers, cursed guides, long dead kings, demented movie starlets, doctors wielding chain saws, doomed miners, evil museum curators, executioners, extraterrestrials, crazed camp chefs, grave robbers, hanging criminals, dread pirates, crypt keepers, insane prop masters, jealous husbands, misguided doll-makers, murderous monks, raving corn farmers, serial killers, torturers, vampires, mad electricians, voodoo priestesses, zombies, and even more terrifying encounters with supernatural beings like Dracula and the Devil himself. Passersby were amazed by the unusually large amounts of blood. We’ve encountered ghosts in taverns, nautical museums, and movie theatres. We’ve witnessed stabbings, hangings, mutilations, torture, and cold-blooded killers. Around us, the walls move, the floors fall, the ceilings have collapsed. So your haunted house is not recommended for children? Parents, you know your kids best — if you think they can handle it, being them along, but in general the little ones won’t be able to handle it. This haunt takes place in a theater. Do we sit down and watch a play? No, but your walking tour starts inside the theater. You will enter the theater and take your assigned seat until your group is called (THAT’S RIGHT, NO WAITING OUTDOORS IN THE COLD THIS YEAR!). When it’s your group’s turn, you will begin the tour which takes you back stage, down the stairs into the pit of horror, through the dark chambers below, up the stairs and across the balcony,with terror and horror around every corner. Can kids work at the Haunted House? Absolutely. Please note that parents are REQUIRED to sign a waiver to allow the child to work at our haunt.Getting kids involved at a young age teaches them about community service and helping others. For teen-agers, working at the haunted house counts toward any required community service program (school / religious ed / legal requirement etc).Many kids who helped us years ago are now adults who run rooms, serve on the Haunted House committee, have joined the Jaycees, and most importantly, help us battle the evil clown who lives in the sewer below the theater. That’s more of a statement than a question. The Orpheum features a full concession stand featuring candy, popcorn, soda, and many other goodies. This year, the concession stand is INSIDE the theater. The Orpheum features very clean, very nice restrooms. Like all Orpheum shows, parking is where you find it (and free) along Foxboro Common and the nearby streets and lots. Please do not park in private driveways, or in the reserved fire official spaces across from the fire station. You can also park for free in the Invensys Systems parking lot, which is about two blocks from the Orpheum. Follow the directions to the Orpheum, but as you come to Foxboro Common, round the Common until you see the Aubuchon hardware store on the right and the Common on the left. Take a right after the hardware store (this is Bird Street) and proceed straight into the Invensys Systems parking lot at the end of Bird Street. Once you park, simply walk back on Bird Street to Foxboro Common and the Orpheum will be on your right, between the fire station and gas station. The Foxboro Jaycees and Orpheum/Foxboro would like to thank Invensys Systems for the use of their parking lot for this event. Do you use strobe lights in your show? Fog machines? Yes — please be aware that we use strobe lights and fog machines. Some people cannot tolerate strobe lights. Also, we get VERY loud! What happens if I try to use my cell phone during the tour? PLEASE don’t do it. It’s incredibly obnoxious, rude, uncouth, selfish and will NOT be tolerated. You will be asked to shut your phone off before your tour — please do so, it’s better for everyone. Repeat offenders will be asked to leave. Has a Foxboro Jaycee ever been convicted of murdering an unruly haunted house patron? Convicted? No. Unruly patrons are politely and gently escorted out of the building. On a completely unrelated note, please stay away from our dumpsters.